Podcast movement 2018 is THE ultimate gathering spot for anyone interested in or involved with podcasting and the podcast industry. Philadelphia Marriott Downtown in historical Downtown Philly Attendees will have the opportunity to participate in their choice of over 80 breakout sessions and panels, including the Technical Track, Creations Track, Marketing Track, and an Industry Track. The goal of Podcast Movement is to bring together and educate active and aspiring podcasters, and to grow the podcast community and industry as a whole. We do this through educational and informative breakout sessions and panels spread across six tracks, enlightening and encouraging keynote presentations, and fun networking events and parties. With over 3,000 attendees joining us over the last five years from nearly 30 different countries (and growing), we are excited to continue the mission of Podcast Movement for many years to come. The Podcast Movement is for anyone currently involved with, or looking to get into, podcasting and the podcast industry. With over 300 speakers and panelists participating in over 100 different sessions for three full days’ worth of sessions and activities for active and aspiring podcasters. They will be providing basic technical sessions regarding equipment, software, and editing, to learning the best way to craft a story. If you’re experienced, they know even the greats recognize things they need to improve on, so they’re bringing in the best podcasters and industry professionals to help you take things up a notch. And if you’re looking to refine your production, or looking for new ways to monetize, they’ll have dozens of sessions. For those who have been doing this awhile like me, the Podcast Movement evolution will feature a large selection of sessions and panels geared towards “behind the scenes teams” with industry professionals. The most successful networks, ad sellers and buyers, statistic providers, and everything in between will be sharing what has been working (and what hasn’t) in the past year, and what they are doing for the future. hope to gain (1) new friend. hope to see old friends. hope to learn (3) new things, including strategies, techniques and best practices of producing, editing, and sharing content. hope to make a great first impression with someone who can help me go to the next level of my journey. It’s going to be nice to be around people that understand what an RSS feed, wave file, royalty free music, downloads, uploads, Heil PR40, Mixer, blubrry, and libsyn are. I hope to encourage someone else on their journey. If there is anything you want me to pick up, learn or share with you let me know. I will be presenting a five minute briefing, Monday evening called Ignite with nine other folks chosen to “spark” ideas, enthusiasm, etc. Pray for me to succeed. A look back over the past 25 years as a gun rights activist and a company I started called African American Arms & Instruction, Inc. (A3i). Michael reviews some tactical pants. How long have you been my friend? Did we meet in person when I started training security guards in 1987? Did we meet at the Radio One Black family reunion on the mall in Washington, DC back in 1992? We introduced the NRA’s Eddie Eagle to the city and sold out of brochures and stuff. Did we meet in Baltimore City when I gave a safety talk and show and tell in the park at a daycare center and to the cub scouts? Thank you for following this podcast and blog. You are the reason I do this. You have been the positive result from hours of time and thousands of dollars spent. It’s been quite a journey with you. We’ve met at NRA annual meetings, at Gun Rights Policy Conferences, SHOT show, on the range, on the radio, and now on social media. Some folks have actually seen me preaching at the church in Washington, DC. You have seen me on stage. Where you at the NRA Annual meeting when Marion Hammer, Tanya Metaska and Charlton Heston gave me a civil rights award? Did we meet at the state house in Richmond, VA with the testimony for the change of concealed carry laws? Did we meet in Austin, Texas when I was on the hot seat with Attorney Royce West? Did you hear me in South Carolina lobbying that councilmen that was also a Baptist preacher? Do you remember when I spoke in Lansing, Michigan to reform concealed carry laws? Do you remember the bunch of time in Annapolis, Maryland when we tried our best to change the minds of the backwards thinking politicians there? Remember that time, the Brady Campaign pimped the mothers of gang violence in? Were we on the steps of Madison, Wisconsin as the snowflakes fell. The Law Enforcement Alliance of America was big back then. Do you remember when your friend and brother from another mother was quoted in the Wall Street Journal, Washington Post, Washington Times, and Washington Business Journal? Did you see Larry Elders, “Michael and Me ” back in 2004? You should go on Amazon.com and see if it is there. I was hyped on that one. If you are from South Africa, Australia, Great Britain, Canada, or Papua New Guinea did we connect after Miriam Margolyes had me on her documentary the BBC’s “Dickens in America; My American Journey” (2004). Do you remember when I was on TV-One’s, “Sharp Talk with Rev. Al Sharpton” (2007) defending the right to keep and bear arms nationally? That was unreal. This is all before social media really. For most folks though, I think you found me on the podcast. The Urban Shooter that I started in 2007. Was that it? Did we meet in 2014 when I shared a stage with the now president of the United States in Albany, NY? Did we meet when I spoke in Atlanta, GA for the Georgia Gun owners or in Phoenix, AZ for AZCDL.org. I have been there, tried this and that, and failed at more things that you can shake a stick at. I had a cool outdoor internet radio show called Blanchard Outdoors that was doing good till we got comfortable. I’ll share that story offline when we meet if you remember to ask me. It has been in an incredible ride. After four years of qualifying truck drivers, polygraphers, field agents, and police officers for the CIA, for armed duty I had learned more about firearms than anyone in my family. We were hunters and fisherman but owning a firearm for self-defense, carrying one legally concealed, traveling, storing, and using one defensively was not even discussed. When I was moved to work with covert operators, analyst and foreign agents, my life changed. I started to learn what is referred to as “tradecraft.” I found out that I was a knuckle dragger among my Ivy-league peers that would be traveling to the exotic places that I had only seen in James Bond movies. The strange thing was that these folks had little street knowledge and they would be going to the mean streets of capital cities around the world. They couldn’t make it in Newark but they were going to Nepal. They couldn’t survive in LA but were on their way to La Paz. Having spent a few years in the Marines Embassy program abroad, I started to put some of my past experiences together with what these new students might need versus what they were being taught. My initiative was appreciated and ego stroked. I became a trainer of folks going to hostile environments more often and started traveling to our range facility so much I thought they were going to make me a permanent member of the place. It was something I wanted actually. It was too early for that. That position came later and was awarded to someone else. I created a few programs that are still in use in the government. Feeling used and unappreciated I thought about what it would be like to create a firearm safety business to train law enforcement, security and ordinary citizens in concealed carry, home safety and do what hasn’t been done to prevent accidents in the homes of urban Americans. This was 1990. MC Hammer is on the radio . It was before George Foreman was selling grills. He is still boxing and knocks out a guy named Cooney. The Major of Washington DC is arrested in drug sting. Nelson Mandela is freed after 27 years of imprisonment in South Africa. Mike Tyson is knocked out. And I was sent overseas to protect a family from a guerilla army. When I returned I was given additional training and decided to change my line of work. It was in 1991 that I created African American Arms & Instruction, Inc. I pitched the idea to three of my friends on the way back from training one afternoon and two of the three decided to start it. We didn’t have a template, or a good business plan. We didn’t have a business or marketing background. This was before the internet was a staple in every household and cell phone. It was before Facebook, Instagram and Linked-in. Starting at ranges around the Maryland and Northern Virginia area I learned that gun control had taken a toll on my potential audience. The only ones that wanted my services were single mothers of black boys wanting “a man” to teach them and their boys responsible gun ownership, two parent households of black nationalists, followers of Garvey, the Nation of Islam, and those of the anarchist mindset. Security officers looking to get re-qualified for armed duty after failing their shooting days at the range, just wanted to pay me for my signature. They didn’t want to learn officer survival, safety or a better way to shoot and qualify. They were used to paying their “instructors” to certify them. I had major problems with all of it. I was American by birth. My ancestors were enslaved in this land. I was free. I have served my country and was still serving it. I am nobody’s victim. I have been wronged in my lifetime. I have faced racism. I have been in presence of racist black, white and yellow and brown. I know the real thing. I don’t blame anyone for the color of their skin but will judge them on the content of their character. I have a problem with apathy, willful ignorance, and hate. I threw everything into making my business grow as I could in the early nineties. I did it to the point of bankruptcy. I learned the character of my new wife at the time. She was willing to stick by me, though I didn’t deserve it. I was about to give up, when I found out that the NRA was having a board of directors meeting in a nearby hotel in Arlington, VA. I thought I’d crash the party and see what the good old boys are doing. In my mind, they would be holding Pabst blue ribbon beers, talking to congressmen, dressed in bib overalls, blue jeans, and orange hunting outfits. I didn’t know anything about the NRA in 1991. The CIA had shielded me from them whenever we trained. If a class was sponsored by one of their trainers or one of our guys had attended the train the trainer program, the political view point of the NRA was always given with a disclaimer. I didn’t know what my political view point was at that time. I was a hammer of the US Government and I didn’t care who was in office. When I entered the ballroom, I soon found out three things. The first was that I was the only person in the room with a tuxedo or dark suit. The second was the only other black guy in the room was Roy Innis, not counting the wait staff. He nodded to me but didn’t approach me. The third thing I realized was that I had stereotyped the NRA and had made the same “you guys like to dance, eat watermelon, love fired chicken and drink grape Kool-aid,” kinda thing. Three old white guys in tuxedos came over, introduced themselves and ignited my passion for history, and gun rights activism. They cautioned me to avoid the media in the room, so that I wouldn’t come off looking like a “Bubba.” They piqued my interest in history by quoting bits of history I had never heard. I was a proud, intelligent black man, how are you going to tell me about parts of black history that I don’t know? I couldn’t wait to ask my elders, and do my own research. When I found out that they were right, I was ashamed and glad at the same time. What else have I been wrong about in life? It was an awakening to me. I became self-actualized. Slowly through the next few years of speaking engagements, travel, study, and being in the company of state and federal law makers I changed. Abraham Maslow has a pyramid of Self Actualization I learned in Psychology 101. I actually figured what that was when I became self-actualized. I started to be ok with knowing that I didn’t know everything. I started to accept myself as I was. I stopped chasing influencers and live day by day. I took on the name of my website and although it could be a shocking name, I was not into that. I am just unconventional. I begin to grow as an adult. I started to take responsibility for how I thought, and what I thought. I started to feel blessed. I was grateful for everything I had. I realized that everything was small in the scheme of things. And I was not going to sweat it. I started a path to love everyone regardless until they showed me a reason not to. Trying to get on the radio full time as a firearms instructor failed but did get me on monthly as a topic for a well-known urban radio personality to talk gun rights. I learned that the Second Amendment was an evergreen topic in politics. I learned that gun rights advocacy is a cause and not a career. I learned that politics is a self-serving game not a government activity to help someone. They cling to hate, socialism, racism, slave mentality, victimology, false prophets, and group think. In 1992, I started a gun club named after the Tenth Cavalry Army unit aka the Buffalo Soldiers. It was a good premise. I learned a lot about people in the gun community. I learned about the power of numbers and marketing. When I had almost a hundred black people going to the range once a month, it gave me clout I wasn’t ready for. Ranges started to think every black person at the range was a member of our group. I became a local hit. Gun clubs nationally started asking me how to get more people of color into their groups, in order to save them from being ostracized by the community and extinction. I had the opportunity to exploit and I refused. The club was the first group to visit the new NRA building and range facility in Fairfax. A3i took a bunch of photos but we didn’t last that long as a group. By the time, I got a business loan to open a training office near a local Maryland range I was on my own. It lasted a year before going under. As it did, the NRA, the Law Enforcement Alliance of America, American Shooting Sports Foundation, CATO Institute and the Second Amendment Foundation found me. I traveled the country. I ate asparagus, sautéed spinach, and porterhouse steak for the first time in my life. I learned what lobbyist do. I saw what lobbyist see. In 1999, a friend of mine, invested in me and help me build my first website to launch my book. AOL 1.0 was still working by baud modem attached to your phone line. Only big corporations had websites. When Y2K hit, my site was bigger than the NRA’s. I took the opportunity to hold prepping classes we would call today. I had several elder members of the Tenth Calvary that knew how to grow, can and prepare food for the apocalypse. Thank God it didn’t come but we had some good learning sessions. I started writing my book, Black Man With A Gun that is no longer in print when I was working as a sexton in a church where I later received the Call to ministry in. I thought that was going to be it for the Black Man With A Gun, but it is not. I even got in trouble there a few times. I was close to the end of my career in the government and was failing to get promoted because (1) I was rebellious, (2) was told they had seen me on TV, print magazine and wouldn’t be here much longer (3) I don’t even know what the last one could be, accept I thought they we retrying to get rid of me permanently a few times, but I am protected by the Blood of Jesus. When my cousin, got a signing bonus to go from the Buffalo Bills to Chicago Bears, he loaned me some money to publish my book, and relaunch my business. I was so much in debt at the time, it was a nightmare. Another fail for your friend and brother. 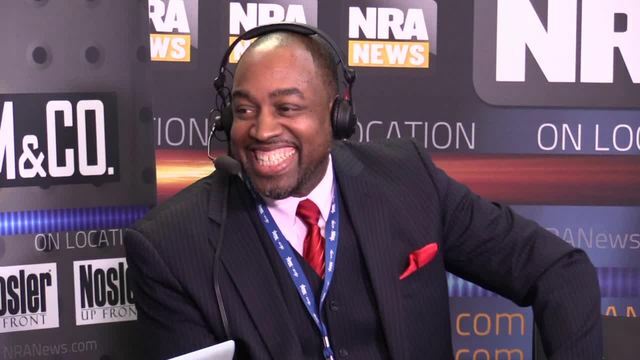 I was now known around the country as “that black guy into guns.” But it didn’t move the needle for me. African centric book stores refused to sell my book, saying they don’t want to promote violence. This is the same bookstore with books written by pimps, hitmen, and drug dealers. Oprahs’ people sent me an inquiry note, reviewed my book and then six months later said it was not something they wanted to promote. The gun club started to grow and chapters grew in New Jersey, Baltimore and Chicago but I was not into the attention I was getting. I even got some correspondence from South Africa. They were looking for a leader to spark the cause. And that even happened here. I was still an employee of the US Government. I fully knew about organized domestic terrorism and the groups looked like. I also knew that I had a very high government clearance I didn’t want to lose. I thought about and was approached to run for governor under the Libertarian ticket while I was still a government employee, so I declined. It was nice to be asked though. Since then we have been just bee bopping around. I’ve started a few new podcast. Taking my ministry online with Speak Life. You got to pay to play on several things. • I tried buying a range once. • I tried getting on a radio station. • I ran for public office once. Here’s some post I have written over the years.